Nature shows are favorites for my husband Lee and me. They allow us glimpses into the animal kingdom that would otherwise be hidden from us. An added benefit: Watching these creatures in action often gives us valuable insights for our own lives. Take for example, the young wood ducks featured in the 2103 Emmy award-winning PBS Nature Program, An Original DUCKumentary. 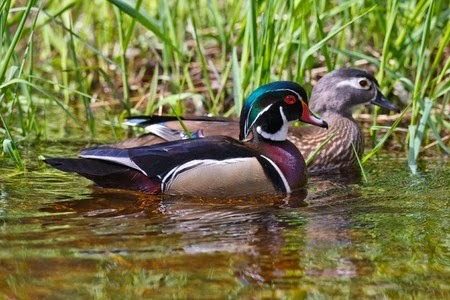 The mother wood duck lays her eggs in a tree cavity, up to 70 feet above the forest floor. Although she lays just one egg per day, the chicks all hatch on the same day. And just 24 hours later, they’re ready to greet the world. First, the mother flies out from the nest and lands on the ground nearby. Then she starts calling her babies to join her. One by one they venture to the edge of the nest hole. At this point, their wings are not developed and they’re incapable of flying. So you wonder, how are they going to get out of there alive? The first one looks out, hesitates for just a moment, and then jumps. You watch incredulously, thinking it’s headed for certain death. But instead, this one-ounce ball of fluff lands softly on a bed of leaves. The others follow in turn, and together they pursue their mother’s voice, waddling behind her as she leads them to the water. The scene is remarkable. We were holding our collective breaths, wondering how these delicate creatures could possibly survive such a fall. This brief video (1:33 min) shows exactly how they do it. There’s no place for fear or self-doubt with these young birds. They’re driven by the need to be with their mother, and this burning goal over-rides the brief uncertainty they might experience just before making their tremendous leap. For me, it’s a valuable lesson in courage. As humans, we have the unique ability to reason and imagine potential consequences, often to our detriment. We can over-think the situation and allow ourselves to get caught up in negative emotions – projecting bad things that could happen if we take a specific action. This can lead to indecision and inaction as we become paralyzed due to fear of failure, concern about criticism from others, or doubts about our own abilities. "Too much caution is bad for you. By avoiding things you fear, you may let yourself in for unhappy consequences. It is usually wiser to stand up to a scary-seeming experience and walk right into it, risking the bruises as hard knocks. You are likely to find it is not as tough as you had thought. Or you may find it plenty tough, but also discover you have what it takes to handle it."